SAN DIEGO (AP) — Bre Payton, a writer for the conservative news site The Federalist and a frequent guest on the Fox News Channel and other media outlets, died suddenly Friday at the age of 26. The Federalist and a friend, Morgan Murtaugh, confirmed Payton's death in San Diego. A spokesman for the Arizona governor says Jon Kyl could be sworn in as a U.S. senator as soon as Tuesday evening but it will likely occur Wednesday. This week's gallery includes Meghan McCain mourning her father, Sen. John McCain; protests in Germany and North Carolina; and a costumed participant at a baroque festival in Germany. PHOENIX (AP) — A former vice president, an NFL star and other friends remembered Sen. John McCain as a "true American hero" — and a terrible driver with a wicked sense of humor and love of a good battle — at a crowded church service Thursday for the maverick politician that ended to the tune of Frank Sinatra's "My Way." LOS ANGELES (AP) — Former "Fox & Friends Weekend" host Abby Huntsman is joining "The View." In a statement Tuesday, Huntsman said she was excited to return to her professional roots at ABC, where she began her journalism career. She'll be working as a co-host with "The View" moderator Whoopi Goldberg and co-hosts including Meghan McCain, daughter of the late Sen. John McCain. The subject of whether the White House owes Sen. John McCain an apology for an aide's disparaging comment did not come up during President Donald Trump's lunch meeting Tuesday with Republican senators, GOP senators said. SALT LAKE CITY (AP) — Utah Sen. Orrin Hatch is apologizing to Arizona Sen. John McCain for saying it was "ridiculous" to ask President Donald Trump not to attend his funeral. SEDONA, Ariz. (AP) — Meghan McCain has posted a photo on social media of her with her father, Sen. John McCain, saying there's "no place I would rather be." The photo posted Sunday on Twitter shows Meghan McCain and her father wearing warm clothing on what appears to be a patio. The 81-year-old Arizona Republican has been battling brain cancer. He was diagnosed last summer. PHOENIX (AP) — Sen. John McCain continues to undergo treatment in Arizona, but Meghan McCain said it's possible her father could return to Washington by the summer. Meghan McCain on Tuesday gave an update on her father's health to a Phoenix radio station, saying a timetable has not been determined for her father return to the Senate. NEW YORK (AP) — Sen. John McCain's daughter Meghan says it was incredibly hurtful to see President Trump talk about her father at a conservative conference last week, where the president talked about how McCain derailed last year's bill to repeal his predecessor's health care law. 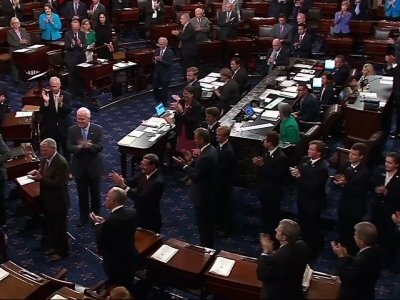 WASHINGTON (AP) — President Donald Trump renewed his criticism of John McCain for the senator's dramatic thumbs-down deciding vote last year against the GOP health care repeal. Without using McCain's name, Trump spoke of his move in December that effectively defeated the overhaul in a close vote. "The View" ABC's daytime talk show geared toward women is enjoying a resurgence in its ratings, thanks in part to a new executive producer focusing on politics in the Trump era and to the lone conservative voice among its bevy of liberal co-hosts. 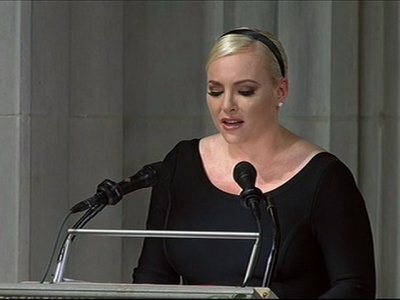 Meghan McCain, daughter of Sen. John McCain of Arizona, stands out from her TV colleagues as the panel's only member who is not a comedian or journalist. Since her October arrival, "The View" has notched its best ratings in three seasons. NEW YORK (AP) — "The View" is giving new panelist Meghan McCain a birthday present on Monday. It's a visit from her dad. The daytime talk show said Thursday that it has booked Sen. John McCain as a guest. Meghan McCain, who joined "The View" last week, turns 33 on Monday. The visit is especially poignant since the 81-year-old Arizona senator and 1988 Republican presidential nominee has brain cancer and said doctors have given him a poor prognosis. NEW YORK (AP) — Meghan McCain was welcomed to the air Monday as the newest co-host of ABC's "The View." McCain, the daughter of Sen. John McCain, will represent a conservative perspective on the daily chat show. She replaces conservative commentator Jedediah Bila, who exited "The View" last month. McCain joins a panel that also includes moderator Whoopi Goldberg and co-hosts Joy Behar, Sara Haines, Sunny Hostin and Paula Faris. PHOENIX (AP) — The daughter of U.S. Sen. John McCain of Arizona says the 80-year-old lawmaker has completed the first round of radiation and chemotherapy as he battles an aggressive form of brain cancer. Meghan McCain also tweeted Friday afternoon that her father's "resilience & strength is incredible. Fight goes on, here's to small wins." McCain, the Republican presidential nominee in 2008 and a six-term senator, was diagnosed last month with glioblastoma (GLEE'-oh-blas-TOH'-muh). Arizona U.S. Sen. John McCain has been diagnosed with an aggressive brain cancer after undergoing surgery to remove a blood clot above his left eye, dealing the latest challenge to a sturdy Republican maverick who has survived melanoma, nearly two dozen bombing missions in Vietnam and torture during his 5?1/2 years in a prisoner of war camp. WASHINGTON (AP) — After Nordstrom dropped Ivanka Trump's fashion line, President Donald Trump quickly tweeted his disapproval. A day later, the president was the target of venom from Meghan McCain, angry over Trump's criticism of her father, Arizona Sen. John McCain. Different circumstances, the same lesson: Don't mess with political dads and their daughters.